I love the crunchy mess they are to eat. It gets everywhere! Max and I have been waiting all week for our snack night dinner so when Friday night came, it was time for kale chips! I sprinkled these with salt, pepper, onion powder and garlic powder. I also roasted peppers and carrots and served all of this with socca crackers, fresh mozzarella (nutritional yeast for me) and roasted chicken for the guys. It's been too long since our hors d' oeurves dinner. So much fun and so delicious! Tony got his wings on Saturday. We rarely go out for dinner, but we decided that after cleaning the house all day and doing other odds and ends that a treat out was just what we all needed. It was a blast with the boys. I also scored some great workout clothes at TJMaxx! Love that place for great prices on workout clothes (which also happen to be work clothes). I'm not especially looking forward to this week...I have to get my driver's license renewed and I have to get my car tags renewed. Yeah, be jealous now. I also threw a fit like a two year old because the online system told me that I can't renew my license online and that I have to go to the customer service facility. Now that sounds like fun, right! I will try to put my positive foot forward and hope to at least get some good people watching out of it. Are you looking forward to anything this week? Give me something good! There are few things more frustrating than dealing with car stuff! I feel your pain! Oh yay for finding stuff at TJ Maxx! Glad you guys got out and enjoyed dinner together. Love that you slept in too! I always hear about people getting workout clothes at TJ Maxx, but when I go I never find any! I guess I need to try a diff. TJ Maxx. I love getting workout and work stuff at TJ Maxx. Regarding Kale Chips - yesterday I told Jason that I was going to try to make more "normal" foods for him and he was like, "Yeah, I don't like kale chips and stuff." And I said, "Oh! Great idea, I have some kale in the fridge." and made some for myself! Ugh-- nothing worse than knowing a trip to the DMV is in your near future!! Hope it goes well! i totally miss my TJ maxx workout gear. SO CHEAP! Glad you got some good deals. buy up for me too and please pass the kael chips. Glad you got some rest and family time this weekend, and well done for getting up so early up to work out this morning! Very impressive and inspiring. I hope the driver's license renewal goes smoothly - those things are always a pain, but luckily they don't come up very frequently. P.S. 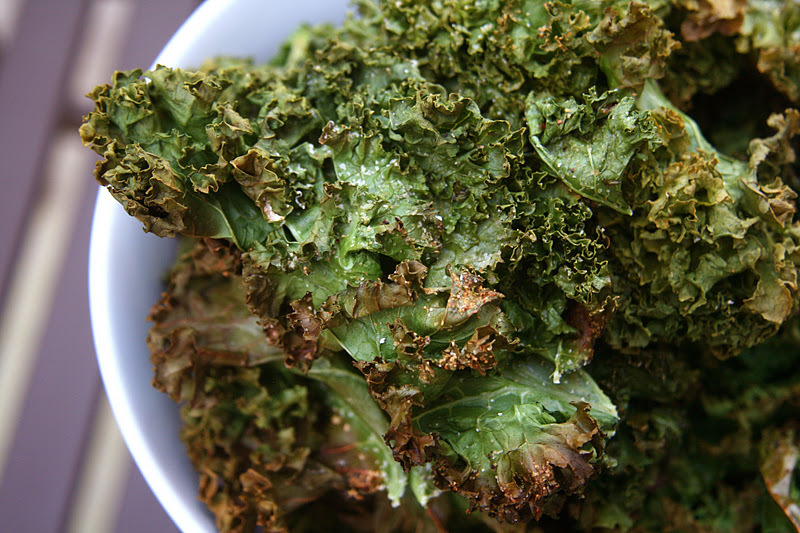 I haven't checked your recipes for this yet, but if you haven't posted it, I would love your recipe for kale chips. I tried making them once myself and they weren't very good...so I need to try another recipe. I totally feel your pain the car thing---My registration expired, and I actually did order a new one online in time, but it never came (which I'm pretty sure is my fault because they don't forward those things and I've moved...and changed my address in the system after I ordered the registration). I'm dreading going to do it in person---but I need to because it expired the day after christmas! Blah! I love kale chips---earlier this fall I made pizza flavored chips and they were so good, I couldn't stop eating them! Oh, I also agree about TJMaxx for workout clothes---it's so hard to pay full price after shopping there! We have two cars and both are up for renewal this month. One passed emissions testing today, and one more to go. Thank goodness we only have to do this once a year. I think the best of both worlds would be kale chips AND wings. 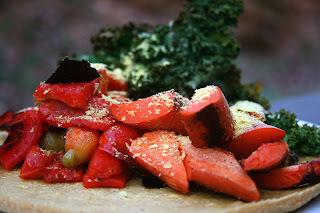 :) Been meaning to try kale chips for Summer - hope she loves them as much as her mama. Would give me an excuse to make them more often. P.S. Haven't answered my comments, but YES, I would love to get together when you come to Nashville. So excited! 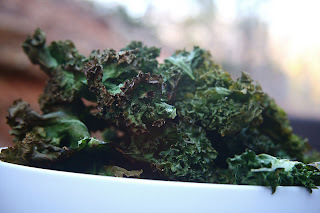 I am always amazed how quickly I can eat kale chips :) they never last long around hear. We have gotten lucky a few times at TJ Maxx and found some cute things! I have to go get my drivers license renewed this week as well.... Not looking forward to it! PS- I cna't remember the last time I went to TJ Maxx. I need to go there. We just bought our first bag of kale this afternoon and I'll be making kale chips for my boyfriend for the very first time. I've heard such good things about them! Agreed. TJ Maxx has the BEST selection (and price) when it comes to workout clothes...I rarely shop anywhere else!